If there’s one thing we hate about our non-Pixel Android phones, it’s the lack of regular and speedy updates. Whenever a new version of Android comes out, even just a small one, it takes LG, Samsung, Sony, HTC, and everyone else months to push out an update to their latest phones. And if you don’t have a flagship phone, you’re lucky to get an update at all. But a major change coming to Android O might make our hand-wringing a thing of the past. In a post on its developer’s blog, Google unveiled a sneak peek at Project Treble, which it says is “the biggest change to the low-level system architecture of Android to date.” In a nutshell, it aims to significantly lessen the burden on third-party phone manufacturers so they can deliver updates in a timely fashion. All about that Treble: While we still have a long time to wait to see if Project Treble actually does what Google says it will, for the first time since Android launched, we have hope. By removing much of the legwork required by manufacturers to push out a new update to Android, devices that ship with Android O should have a much easier time adhering to Google’s security and version upgrade schedule. 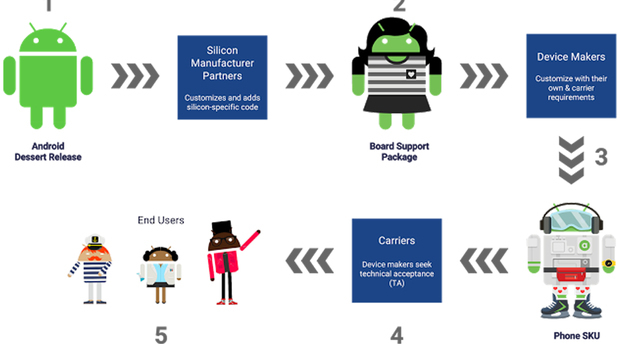 Silicon manufacturers pass the modified new release to device makers—the companies that design and manufacture Android devices. Device makers modify the new release again as needed for their devices. Project Treble lets device manufacturers focus only on the parts of Android that affect their phones. In addition to the architectural changes, Google is working with its partners to move their code changes into the common Android Open Source Project codebase. As Google describes, Sony and Qualcomm have already contributed “dozens of features and hundreds of bug fixes to Android O,” so they won’t have to redo their work with each new Android release. Google plans to publish the full documentation for Project Treble on source.android.com with the launch of O later this summer. But we expect to hear a lot more about it at Google I/O next week.